Walking Randomly » Free mathcad alternative, SMath Studio, updated. Now with Units! The live version is fine for desktop computers, however when used on the iPad there is nothing to trigger the keyboard. A little attention there and the SMath Studio Live will be a game changer. it looks like a combination of mathcad and mathematica. The actual version is 0.89 and is still in progress (the new one is in preparation). It is really amazing what one man can do (Andrey Ivashov). 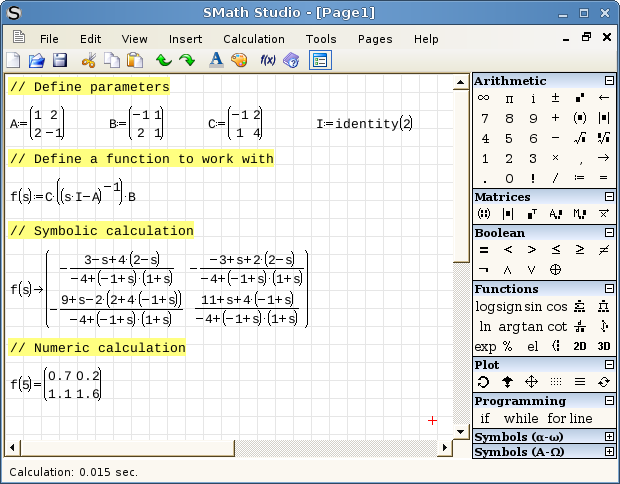 If you are a programmer, just take a look at it and see if you would like to make a plugin for SMath. This does look great. I wish I could download. My Trend Micro virus scanner blocks smath.info as a “malicious” site. I tried SMath, beta ver 0.89.8, (www.smathstudio.com) and found it to be very similar to MathCad. There are a few quirks that need to be worked on but overall it has most of the MathCad type features that I like to use as an engineer including the WYSIWYG whiteboard and units. As I previously posted, I’ve been using MathCad for a lot of years and recently upgraded to ver 15 so I could get printouts to pdf files. It became almost impossible to get a printout in ver14. SMath appears to me to be a very good alternative. You can still run it on an older machine (we have several around the office that can not handle MathCad very well) and the best part is the cost… FREE! I think we will try to make the switch to SMath. I’ll keep you posted.